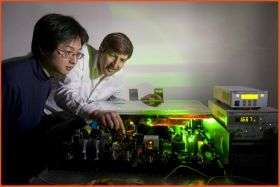 Post Doc Chih-Hao Li and Ronald Walsworth with new laser device. Harvard scientists have unveiled a new laser-measuring device that they say will provide a critical advance in the resolution of current planet-finding techniques, making the discovery of Earth-sized planets possible. The discovery of planets outside of our solar system, called “exoplanets,” is one of the hottest fields in astronomy and holds great promise to increase our understanding of Earth’s solar system and of how life first took hold on this planet. The problem, however, is that the two main techniques to find exoplanets rely on the planet’s very small effect on its star. One measures the star’s “wobble” due to the planet’s gravitational pull as it circles, while the other measures the dimming of a star’s light as a planet passes in front of it. With current technology, both of these techniques can identify relatively large planets that have a noticeable effect on their star. Large planets, however, tend to be gaseous giants, like our solar system’s Jupiter and Saturn, incapable of supporting life. Smaller, rocky planets, like Earth and Mars, are thought to be the likeliest candidates for life, but are too small to be detected by current techniques. The new device, called an astro-comb, uses femto-second (one millionth of one billionth of a second) pulses of laser light linked to an atomic clock to provide a precise standard against which light from a star can be measured. Ronald Walsworth, senior lecturer on physics in the Faculty of Arts and Sciences, senior physicist at the Smithsonian Astrophysical Observatory and in whose lab the astro-comb was developed, said it may increase the resolution of the star “wobble” technique by about 100 times, which would allow detection of a planet the size of Earth. “The existing tools, prior to astro-comb, couldn’t do the job,” Walsworth said. Both Walsworth and Astronomy Professor Dimitar Sasselov, director of the Harvard University Origins of Life Initiative, said that the final resolution of astronomical observations taken using the astro-comb may be somewhat lower than what would be ideally possible because other factors, such as “noise” in stellar atmospheres, may affect the quality of measurements. Still, Sasselov said, planets close to the size of Earth — and that share enough of Earth’s characteristics to harbor the conditions of life — should be detectable within the next few years using the astro-comb. The ability to find and analyze Earthlike planets is an important step in obtaining baseline information with which to understand how life on Earth arose, said Sasselov. The Origins of Life Initiative, he said, brings together experts from a variety of fields whose expertise is pertinent to understanding the planetary roots of life in the universe. By studying conditions on Earthlike planets circling other stars, he said, scientists may be better able to understand what conditions were like on Earth before life arose. That understanding, he said, could inform the research of chemists and molecular biologists seeking to learn how organic chemicals came to create the chemistry of life. "I think this is super-exciting, from the point of view of furthering this new field of science: the exploration of environments out of this solar system,” Sasselov said. The astro-comb was developed in a collaboration between physicists and astronomers working at the Harvard-Smithsonian Center for Astrophysics and Harvard’s Department of Physics and Origins of Life Initiative, as well as Massachusetts Institute of Technology’s Department of Electrical Engineering. In particular, both Walsworth and Sasselov credited the interdisciplinary environment of the Center for Astrophysics and the vision of the Origins of Life Initiative for bringing together experts in diverse fields whose work made the advance possible. Three years ago, as a classroom exercise in a physics course he was teaching, Walsworth began mulling ways that an existing instrument, called a laser comb, could be used to solve the knotty problems of astrophysics. At about the same time, Andrew Szentgyorgyi, an associate of the Harvard College Observatory and senior astrophysicist at the Smithsonian Astrophysical Observatory, began hearing about laser combs and was trying to find someone knowledgeable enough about them to tell him if they could be adapted to his astronomy research. Finally, in frustration, he went to Walsworth’s office. “I knocked on his door and asked, ‘Do you know anything about these laser combs?’ He said, ‘Do I know anything? I have one,’” Szentgyorgyi said. Laser combs have been around for a decade and are used in creating extremely precise clocks. The combs work by creating regular spikes of laser light that are evenly spaced in wavelength — like the teeth of a comb — and can be projected onto a light-spectrum measuring device called a spectrograph. Against such a precise background, physicists and astronomers can accurately measure the light from various sources, including the light from stars. Laser combs hadn’t been used in astrophysics before now, however, because of technical problems that made them too precise — the teeth on the light “comb” they created were too close together to be useful in measuring starlight. Walsworth and colleagues added a filtering device that spreads the laser comb’s teeth apart by a factor of about ten, and stabilized the system to an atomic clock, creating the first laser comb appropriate for astrophysical research. “Now we can tune the system and get out exactly the light out that a particular astrophysical spectrograph needs,” Walsworth said. Though its most high-profile application will be the search for exoplanets, the astro-comb can measure other light coming from the heavens as well. In fact, it will get its first tryout in late spring at the Mount Hopkins Observatory in Arizona examining stars in a nearby globular cluster to see if their motion is affected by the theorized presence of dark matter there. Once that trial is complete, a new astro-comb will be constructed as part of the Harvard University Origins of Life Initiative with the aim of deploying it at a project being built in the Canary Islands for exoplanet research, called the New Earths Facility. Szentgyorgyi, who will head the Canary Island team, said they will first take the astro-comb to Geneva to calibrate it with equipment being built by European collaborators and then install it in the Canary Islands. It will be operational sometime in 2010, he said. Very little detail on the comb itself, but still interesting.